In Key Stage 3 Drama at Ysgol Clywedog students will have one lesson per week, depending on their particular year group. An introduction to the subject of Drama via a varied field of group work activities, team-building exercises and bonding games. Drama at Year 7 has now had it’s allocation increased by 100% from one lesson per fortnight to one lesson per week. Pupils will build upon and refine the Drama skills and work commenced in Year 7. Special emphasis will be placed on both how to use voice effectively and audience awareness and positioning. As with Year 7 Drama, Year 8 has also had it’s timetabled allocation increased by 100% to two lessons per fortnight. The final year of mandatory Drama at Ysgol Clywedog, taught in fortnightly lessons, sees pupils move from predominantly group work, to more pair based work with a greater focus on mime and movement based Drama. 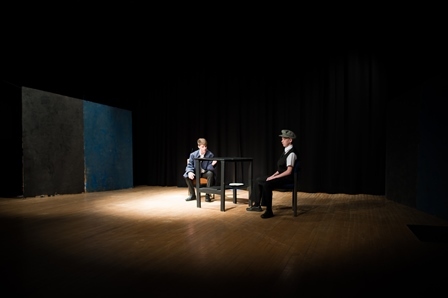 Year 9 includes more acting and a larger number of assessments than the two previous years as pupils decide whether or not they would like to study the subject at GCSE. STOP…Press!! Did you know that from 2014-2015 the number of Drama students achieving a Level 1 GCSE Qualification in Drama went up by 65.4% & that the number of students achieving an A*-C grade in GCSE Drama increased by an enormous 94.1%, a new school record number in both areas! GCSE Drama at Ysgol Clywedog is taught across five lessons per fortnight – each lesson being one hour in duration – and currently adheres to the WJEC syllabus. This is made up of an analysis of various dramatic genres and performance styles with a structured study of the work of the theatrical practitioners Konstantin Stanislavski, Vsevolod Meyerhold and Berthold Brecht via script-based and devised composition practical performances. The breakdown of units of work in WJEC Drama GCSE iS conducted through four modules over the twenty four month course. However, it is worth noting that I outline this from an “Acting” perspective; pupils are eligible to be assessed on “Set Design & Construction”, “Costumes & Make-Up” or “Sound & Lighting” in the event that they would prefer these options. Pupils compose their own play, based on a choice of titles, or pieces of art or music, devised utilising the stylistic features of a famous dramatic practitioner. This production must contain between two and five pupils and must be between ten and twenty five minutes in duration. Via Drama Theory lessons and a detailed logbook, compiled during Module 1A, pupils must complete a five hour written Controlled Assessment, in which they must layout and analyse – in detail and complexity – how they performed in Module 1A, stating how and how accurately they feel they adhered to the success criteria and examination guidelines. A second practical examination, assessed by an external WJEC Moderator, in which pupils (again, in groups of two to five and in performances between ten and twenty five minutes in length) must act out a one-act-play, or an extract or a scene from a published play. The final, written, summer examination in WJEC Drama GCSE is split into two segments. The smaller segment sees a written response where pupils explore and evaluate their own performance in Module 2. The larger section is on one of a choice of set texts – comparable to English Literature GCSE – after extensively studying the chosen play, they must complete an examination paper containing questions testing their knowledge on the text and their understuanding of theatre, were they to put on a production of the play in question.